Hydroplaning occurs when a layer of water causes your vehicle’s tires to lose traction with the roadways. The result is a loss of control, steering, and braking ability. While hydroplaning can’t always be prevented, there are some driving techniques you can use to decrease the chances of it happening to you. The risk of hydroplaning can be reduced by driving carefully and using the following tips when the roadways are wet. Reduce your speed and avoid sudden acceleration. Hydroplaning is most likely to occur when your speed exceeds 35 miles per hour. Keep your tires properly inflated and well maintained. Avoid driving on bald or worn tires, which have less traction. Moreover, rotate and balance your tires regularly for better contact with the road. Don’t use cruise control when it’s raining. Cruise control can cause your tires to spin faster and lead to a loss of control if you start to hydroplane. Avoid driving through standing water and puddles. Try to drive in the center of the lane and avoid the sides of the road where water is most likely to pool. Taking extra caution on wet roadways can reduce your chances of hydroplaning. If you get caught hydroplaning, however, there are some tips and driving techniques you can use to regain control of your vehicle. Try not to accelerate or brake suddenly. Sudden changes in speed can cause your car to skid. Instead, ease your foot off the pedal gently to decelerate. Gently turn your steering wheel in the direction your car is hydroplaning. While this may feel counterintuitive, it helps you realign your car and regain control. Wait to feel your tires regain traction. If necessary, pull over to a safe place to regain your composure. 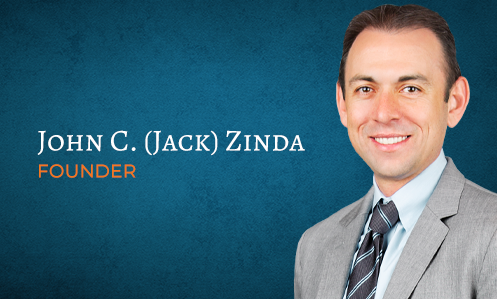 If you have been injured in a hydroplaning accident, call the car accident attorneys at Zinda Law Group at 800-863-5312 for a free consultation. Our personal injury lawyers can help you understand your rights and options after a hydroplaning or motor vehicle crash.